If you have a treasured pet that provides you comfort and is part of your overall therapy for an emotional or mental disorder, you probably want to keep it close to you at all times. Many people in this situation get certification to qualify their pet as an Emotional Service Animal, which gives you certain rights not afforded to other pets. If you’re interested in getting an ESA letter and how this will affect your pet when you stay in hotels, here is the information you need to know. 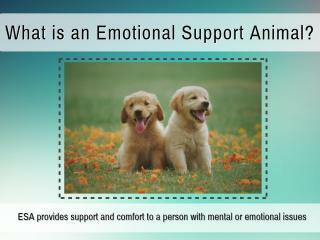 An ESA can be any animal that provides support and comfort to a person with mental or emotional issues. These can include anxiety, post-traumatic stress disorder, social phobia, depression, or similar conditions. Any type of pet can be considered an ESA, though the most common are cats and dogs as they are easy to travel with and tend to exhibit more of the qualities that are comforting to their owners. To have your pet considered as an ESA, you must get a legitimate ESA letter. How are Emotional Support Animals Treated at Hotels? With a legitimate ESA letter, your animal may travel in the cabin of an airplane with you and live in your home with you with no extra fees or restrictions. However, hotels are not bound by any laws governing ESAs. They may exclude your pet from staying in their hotel with you if they see fit. A general rule of thumb is that if a hotel is pet-friendly, it will also be ESA-friendly. In some cases, hotel management will be understanding of your situation with an ESA. It never hurts to call them before booking and tell them about your condition and your pet’s status as an ESA. They may be willing to allow your pet to stay with you even if they are not technically a pet-friendly hotel. Where Can I Find an Animal-Friendly Hotel? Hotels are more and more likely to welcome pets at their establishments. Most hotels will state they are pet-friendly on their websites and in their marketing efforts. Many travel sites may also indicate if a hotel is pet-friendly. If you want to book a hotel room and do not know if they will allow your ESA to stay with you, simply call or email ahead of time to find out their policies regarding pets. If you are interested in getting an ESA letter so your pet can live with you, travel with you on airplanes, and stay close by your side, you need to talk to a doctor or licensed mental health professional. If you already see someone for your emotional disorder, you can ask them about getting an ESA letter. You can also go online and find a reputable business that offers ESA letters online. You will be able to speak to a doctor or LMHP about your condition so they can qualify you for a letter. If you are approved, you can have access to your ESA letter instantly. Your pet can have a wonderfully therapeutic effect on your life. When you get your ESA letter, you can ensure they can stay by your side in your home and when you travel on airplanes. previousGOLO Diet Review - Is It Healthy And Beneficial For Weight Loss?